Instead of pizza sauce, it has a spicy salsa and then top it with mellow ricotta cheese, sweet shredded carrots, red onion, red pepper, mushrooms and diced tomatoes. After baking each slice is topped with a large dollop of guacamole. The resulting pizza is loaded with toppings that are a wonderful balance of sweet and spicy, creamy and crunchy. It's my new favorite pizza. This recipe takes about one and half to two hours to make start to finish. Pour the cup of warm water into a large bowl. The water should be about 115 degrees F, about the temperature of a nice bath. Add the sugar and stir to dissolve. Then sprinkle the yeast on top. Cover the bowl with a towel and allow the yeast to bloom for about five minutes. Check on your yeast to make sure it has bloomed. The water should now be covered in a thin layer of frothy foam. Using a wooden spoon, stir in the olive oil, salt and wheat flour. Let the dough stand. Wheat flour takes longer to absorb water than white flour so I like to give it five minutes or so before adding in the white flour. Start mixing in the white flour half cup at a time until the dough is really hard to mix. Then use your clean hands to knead the dough. I like to knead right in the bowl or you can turn it out on to the counter. Meanwhile, dice and slice your toppings. Preheat the oven to 375 degrees F. Generously sprinkle a generous amount of corn meal on to your pizza baking pan. Punch the dough down and turn it out on to a clean work surface. Roll out the dough to the size of your pizza pan. Transfer the dough to the pan and let it rest ten minutes before layering on the toppings. Top your pizza in the following order: salsa, ricotta cheese, jack and provolone cheese, carrots, tomatoes, onions, red peppers, mushrooms. Check out the animated gif above! Bake your pizza for 15-25 minutes or until the edges brown, and the cheese bubbles. The toppings have a lot of moisture, so I like to prop the door of the open about an inch so the steam can get out. 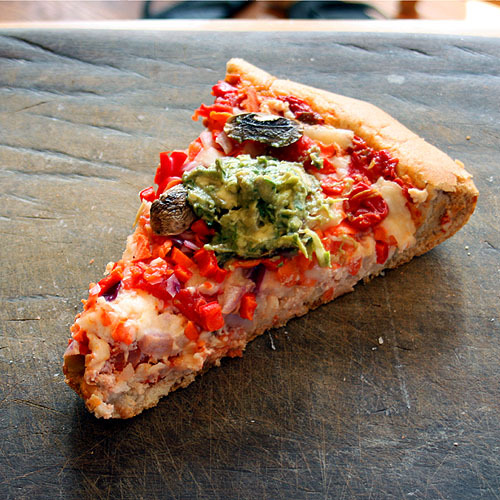 Let pizza sit five minutes then cut into slices and add top with guacamole. A light Mexican beer is the perfect pairing. Love these tops and a very delicious one! This pizza looks delicious! I love veggies on pizza. That sound soooooo freakin' delicious. 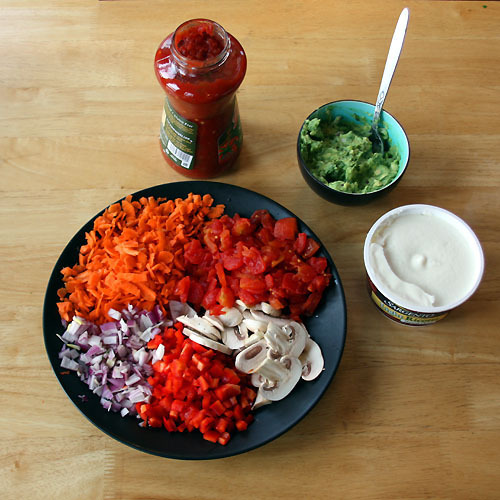 It's definitely a unorthodox combination of toppings, but it sounds quite wonderful (and not to mention flavourful, what with the salsa as a base). Love the idea of topping the baked slices with a dollop of guacamole, too... downright brilliant! We love veggie pizza, but never had this combination of flavors, which sound wonderful, especially with the guacamole topping. Love the animated pics. How did you do that? My husband is the king of pizza making---we rarely go out for it. I will hand this to him. We're both huge guac fans. Sounds great for a spring meal! Except the only avocados in season right now are from Chile. Boo. And a huge compliment to your pizza making slide show. That is extremely cool and eye-catching. This really looks great! I love the toppings - nice change of pace! We do pizza's on Fridays for game night. I can't wait to try your Malibu pizza recipe, great idea with the salsa as the sauce, I am already imagining the flavors. Thanks so much will let you know next week how mine turns out. Mmmm...looks really good! I could eat avocados and/or guacamole for every single meal. very interesting toppings. Looks really good. This looks yummy….you have a lovely blog… You have so many wonderful pizza recipes.I have bookmarked you blog and some recipe from that to try. Hello. this dish appears yummy and delicious and i have never tasted it before.but it looks so luring that i cannot stop myself to ask my mum to prepare it for me this pizza .